This is a guest post from the lovely Paige. As I mentioned before, I am trying to start being better at meal planning and since I have no experience in the field, I reached out to some people who have been doing it for a while! Thank you for the post, Paige! Hi guys!! I’m Paige from Fit Not Fad, and I’m super excited to be here writing a guest post for Kammie. When she mentioned that she wanted someone to inform her readers a little bit on meal prepping, I was all over it! I’ve been consistently prepping my meals on Sunday nights for about the last six months. I really contribute the fact that I’ve stuck to a healthy and clean diet to meal planning. 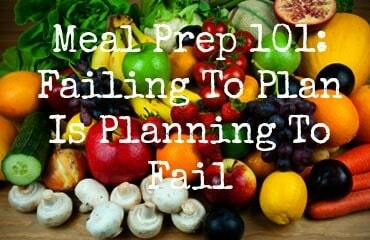 As the title says, if you fail to plan, you plan to fail! And it’s so true. Preparing your meals ahead of time might seem intimidating and take a couple of hours of work, but it is SO worth it when you don’t have to think twice about what to make for your meals the rest of the week when things get busy. My first tip to meal planning is to PREPARE. Every Sunday I sit down and do inventory in my pantry and refrigerator to see what I already have and what I need to buy. I make a chart on a piece of paper and map out what I’m going to eat every day. This way, I can see exactly what I need to make, buy, and store. 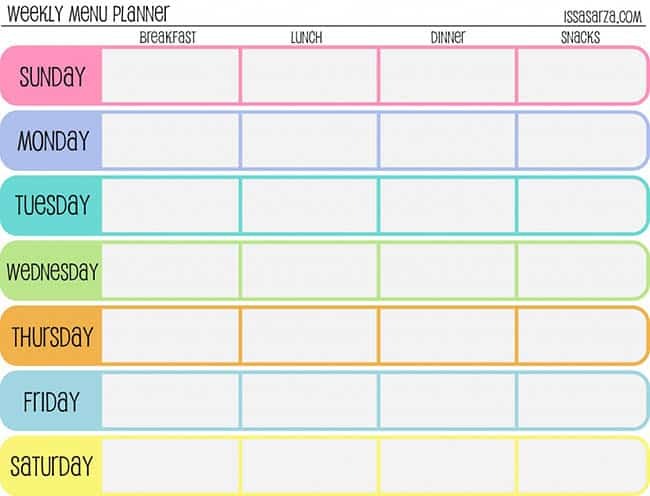 This is the meal planner I use. It’s cute and functional! I found it on a blog online for free. Strawberries and blueberries: I take baggies of these two fruits every day to work. It’s a quick, mess-free snack that stores easy in the refrigerator. I pit the strawberries beforehand so I can just pop them in my mouth!! Chopped veggies: Sliced bell peppers, carrots, and celery are all great go-to snack options that fit perfectly in ziploc baggies and in lunchboxes. Hardboiled eggs: I usually boil a few eggs at the beginning of the week to take to work. They work as a snack, or you can slice them for lunch to put on a salad! Muffins: Muffins are a great, easy breakfast option to prep ahead of time. You can go with a standard blueberry protein muffin, pumpkin muffins, or lemon poppyseed. You could also make egg breakfast muffins with chopped veggies and a little turkey bacon in a muffin tin. These are perfect to grab and go and also store really easily. Chicken: Chicken is pretty easy to make ahead of time because you can eat it in so many different ways and you know it will stay good for awhile. I will prepare five chicken breasts on Sunday, and then slice up a couple for salads and leave the others to eat whole for lunch or dinner. Quinoa: Again, so many ways to prepare quinoa and 1.5 cups (measured uncooked) will be enough for a week’s worth split up. Some other great food items to prepare for the week are hummus, veggie burgers, roasted chickpeas, homemade protein/energy bars, turkey muffins, kale chips, peanut butter protein balls, casseroles, and salads. The second step is the most time consuming: the actual prepping of the food! I suggest doing things by category; do all of the oven items at once, grilling at once, and then the leftover items that just need to be chopped, bagged and stored. I use mostly Ziploc baggies for snack items and Tupperware for my main meals. Make sure you know beforehand which items need to be refrigerated, frozen, or just stacked neatly in the pantry. Meal prepping is a great way to keep yourself on track. It’s easy to get caught up when life becomes busy and grab whatever is close and easy to eat, which is not always the healthiest thing. Meal prepping takes time but is totally worth it because you never have an excuse not to eat healthy when you’ve made everything beforehand. You also don’t have to worry about what to make to eat the next day because everything is done! Whether you are just beginning your healthy eating journey or are a seasoned pro looking to refine your meals, I really suggest meal prepping. If you have any questions or just want to say hi, please feel free to stop by my blog and drop me a line! Do you have any meal planning tips of your own? Love this Paige! On Sundays I feel like I’m slaving in the kitchen for hours but then I remember I have delicious and healthy meals prepped for the week which makes it so worth it! Yeah I know what you mean! It can be a hassle but definitely worth it. Awesome post! I eat 6 meals a day, work (more than) full time, and spend about 1.5 hours in the gym.. meal prep saves my life. It’s also a huge time saver in the long run if you just choose an afternoon and go for it. Love it, great tip Laura! I ADORE the planning boxes – so cute!! I am terrible at prepping my meals ahead of time…I go to the grocery store multiple times a week bc I dont buy enough the first time, ugh!! Hard boiled eggs are a great idea, i forgot about them…I am going to make some tomorrow! That’s a great idea! I bet it makes him excited that he knows what to look forward to each day too!